Roaming the country-side, Gandit can be a sour presence to encounter. Casting looks of disgust at those that pass through, Gandit appears untrusting and bitter. While travelers wearing tattered clothes and appearing down on their luck are left alone by Gandit, those looking even moderately fortunate quickly become a target. Gandit is notorious for coordinating ambushes and robbing individuals, or even small caravans for their material goods. Thieving with an impressive determination and seething, it's clear Gandit sees itself as the an arm of justice, righting wrongs. 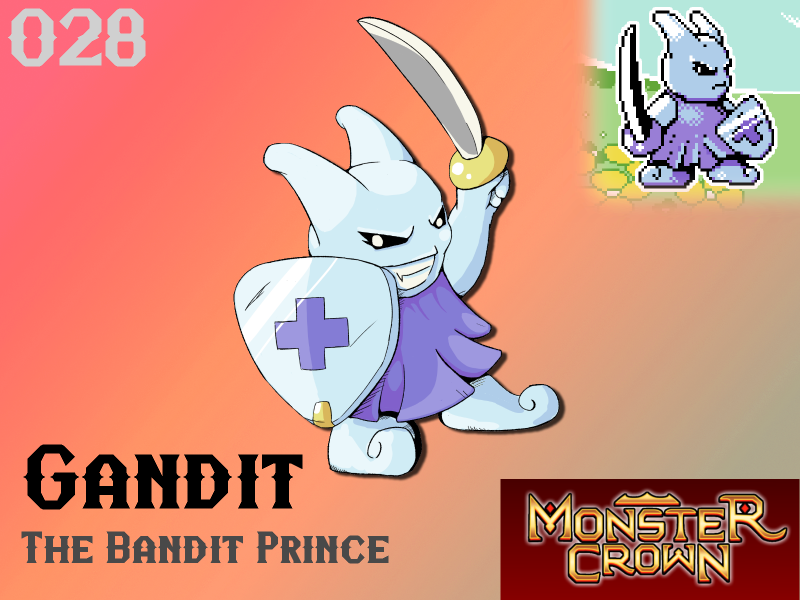 Their shameful level of greed and envy has lead some to draw parallels between Gandit and a previous dark ruler, earning it the title the "Bandit Prince" of Crown Island. Will Gandit make your team? Leaves alone those in bad shape... maybe I won't hunt them like dogs. Bandits, greedy, poor taste in Weapons... nope, no spot on my Team for them.